Fighting cork taint: are screwcaps and plastic corks the answer? Jamie Goode analyses the results from an significant independent study on the effectiveness of wine bottle closures. This scientific paper, published on July 12 2001, has thrown up some surprising results, and the ongoing trial it describes promises to answer the key question of whether alternatives to cork are suitable for long-term ageing of wine. The widespread existence of cork taint, caused by chloroanisole compounds, is now universally acknowledged, although there is still debate over the prevalence. Whether it is 2%, or 5% - or as some claim, as high as 7% - it's a huge problem, and so wine producers have been looking for alternative closures for some time. But are these alternatives - whether they are screwtops, plastic corks or agglomerate corks - suitable for long-term storage of wine? It's one thing bottling an inexpensive quaffer with a plastic cork, but would a manufacturer be wise in using the same closure on a wine intended for 10 years in the cellar? And even if the plastic cork would maintain a good seal for this length of time, would the wine age differently than if it were sealed with a real cork? These are the questions this study is designed to address. First, it's important to bear in mind that these are the first results to be published from this ongoing study. There is enough wine bottled for the study to continue for a decade, and as such these results are best viewed as preliminary. Having said that, even at this early stage some conclusions can tentatively be drawn. Importantly, this study showed that the wines that retained the highest concentration of SO2 and ascorbic acid showed the lowest degree of browning, and in the sensory analysis tasted the freshest. It seems that SO2 concentration, which is relatively easy to measure, can act as a good predictor of future browning and a useful proxy for oxidation. It therefore offers a convenient way of measuring the effectiveness of a stopper. But how did the different stoppers perform? The curves plotting free SO2 concentration against time show a pronounced dip with all the stopper types over the first year, that then begins to flatten out. The best performance is from the ROTE (screwcap), closely followed up by the Altec and then the Twintop. The two standard corks perform pretty well, as do the Auscork, NuKork, Nomacorc, Aegis, Supremecorq and Integra: these all perform surprisingly similarly. Slightly less effective are the Tage and the ECORC, and the only significantly poorer performer seems to be the poor old Betacorque (which showed dismally). With regard to browning, it's even harder to separate the various stoppers, with only the Betacorque performing less well than the others. The ROTE seems to perform the best again, but not significantly so. As many professionals have long suspected, the Altec cork tainted all the bottles with TCA from an early stage, despite providing a very good seal. Surely the results of this study should spell the death knell for the use of this stopper by producers who care at all about the quality of their wines. Two of the 14 one-plus-one closures were affected, and for both of the normal corks, four of the 14 bottles were tainted with TCA. These results were confirmed with GC/MS (gas chromatography/mass spectrometry; an analytical technique). I was reassured by the fact that the performance of the synthetic closures was very similar to that of the normal corks, but without the taint. What this study doesn't show is that plastic stoppers are unsuited to long-term ageing of wines. We'll have to wait for a few more years' data yet, but I suspect that the best performing synthetic corks will be just as good as real corks, but without the variability in performance. This would be an exciting result for all those who've gone to the cellar only to find that their irreplaceable aged bottle has been ruined by cork taint. Of the synthetics, the best performers in the sensory analysis seem to be the Auscork, Aegis, NuKork, Integra, Supremecorq and Nomacorc. The poorer performers are the ECORC and Tage, and of course the poor old Betacorque. Thus both the extruded and moulded plastic corks show a mixed performance. An important question to consider: do we really want a perfect seal? Assuming that people generally like the way that wines change with age when they are sealed with corks, my assumption would be that all we are asking from the perfect stopper is that it should seal as well as a cork and no better, without the risk of taint from TCA. 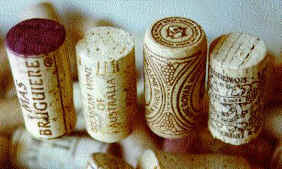 The fact that screwcaps provide a better seal than corks may actually work against them. Indeed, in the discussion of this paper the possibility that the rubber-like aromas were the result of them providing an almost hermetic seal: the report suggests an extended period of anaerobic storage may not be desirable, and this 'reduced' aroma may be avoided by allowing a slightly greater headspace or by treating to eliminate sulfide compounds before bottling. Rather teasingly, this paper mentions that a separate study using measurements of oxygen permeability will be reported elsewhere. These will be of great interest with regard to the role the stopper plays in the normal ageing of wine. I'm also looking forward to seeing the next set of results from this well planned and executed ongoing study. Conflict of interests: None. I have never received hospitality or remuneration from any cork or synthetic stopper manufacturer, and I have no axe to grind or hidden agenda on this topic. Acknowledgements: Thanks to Val Rechner of the AWRI for sending me a copy of this report.